I got a Close out 2018 SG.. My first new Gibson.. I just placed a order for 2018 SG standard. They dropped in price big time and it has locking tuners and comes with a hard case. The big price difference from the 2019 made it possible. No reason to be concerned about year models in this respect. The 2018 is very much like the 2019 1961 Standard but has locking Grover's. Never much cared for the Elephant Ear Vintage styles. The 61 pickups also sounded like a upgrade to me. What are your opinions of the 61'S over the 490's? Good luck. I do not know anything about the 2018 SG guitars but have heard lots of good things about them. The locking tuners are good. 490 series pick ups are not bad either. However if this new sg is anything like my 2007 61 reissue you will be happy. I love my 2018 Gibson SG Naked model, with the black P-90's. Such a great guitar, and it owns the stage. Give us an update when you get her in, and give her a test drive!! you know, we're going to need pics of this guitar when it arrives. someday... i too, will find the right one, at the right time. good for you man! Congrats on the new SG! What color did you get? Cherry, Ebony, or did you go for the Autumn Shade? I went with Ebony on my 2018 Standard. I have 2 Black SG's One is a Epiphone and the other is a Gibson Maestro that I picked up at Walmart for $65.00 new. I modded it and added a second pickup and a new harness. It also has a wrap over bridge with adjustable intonation. Probably got $100.00 bucks in it now. It turned into a great economy Guitar. If I see another one at a good price I buy it too! The new standard is in Heritage Cherry. Autumn shade would have been my choice but they were $300.00 higher than the Ebony or Cherry. My guess is they only had a couple of those. Black is tempting but I don't have a Cherry so it got the hit. Be sure and post pics when you get it! One of the reason I pulled the trigger is Gibson has been pulling back on hard cases and some of the included features. Locking tuners and a hard case should be standard on a Standard. Not after the 2018 model. The Fedex truck rolled last night. Should be here Thursday. This is my first new "real" Gibson Guitar. Everything else is a copy. My Epiphones are copies of Gibson's even though they are a Gibson product. I have a Mexican Strat. Its sorta real. I have been eating more Tacos since I bought that..MIM Strats play better with Taco sauce on the nut... For some reason only other Guitar afflicted people will understand it was important for me to make the move for a real one. My skill level doesn't demand one and perhaps I don't deserve one but they don't sell them on those qualifications.. ..
Of course you deserve it! Everyone should own at least one really nice guitar. Doesn't have to be a Gibson and it doesn't have to be all that expensive but it does have to be really nice. And I'm sure that 2018 SG will fit the bill. Cherry is the classic SG color. When I think SG, I'm not thinking of Clapton's painted wonder or any of the other fancy schemes that Gibson has cooked up during recent years. I'm not even thinking of my Showcase Edition in blue metallic. I'm thinking Cherry all the way. Getting a really good instrument will inspire you to play more so that's always a good idea. Post pictures when you get it! Its here and in good condition. Fedex didn't hurt a thing! I took some photos but have not pulled them off the camera yet. While the Guitar is in very good condition the setup out of the box wasn't so hot. I took the time to make notes on neck relief at every Fret out of the box and after tuning. The Truss Rod and neck were set well. I also made notes on Bridge and stop bar height. I thought it might be interesting to have that written down. The action was skyscraper higher. I'm no setup Guru but I have managed to get my broken rescue Guitars working pretty well. Good experience buying and fixing them. 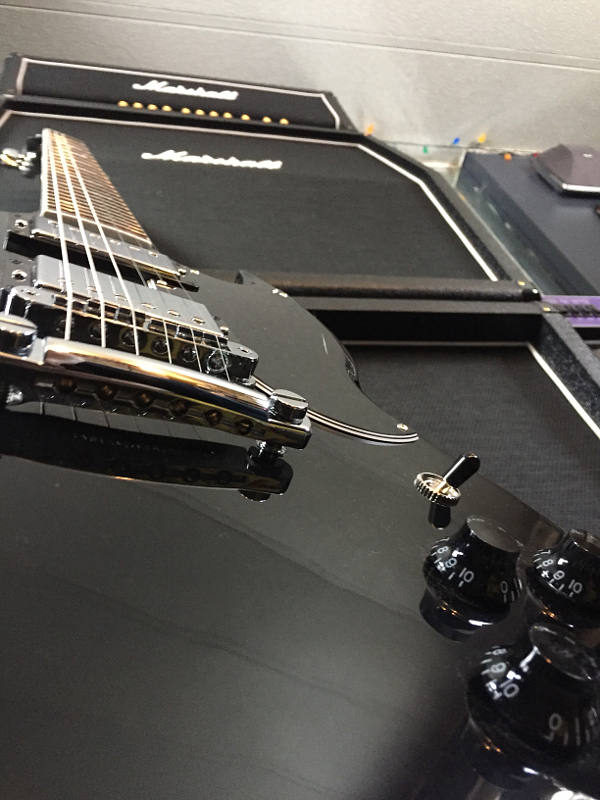 The intonation was off and the saddles were way out of position by how the Epiphone SG's and Les Pauls I have. I pulled the action down and got the intonation dialed in. I was pooped out after all that but managed to hook it up for a bit. You know that had to happen..The SG has some awesome pickups in it. The presets I have been using for my Chinese pickup guitars weren't right for the Gibson. I'll have to find what works for it. It is in a different league tone wise. I"ll get rested up and I have a couple of Marshall amps I want to introduce to the Gibson. Way to go, I'm sure the SG will slay! I feel you about Gibson loading their guitars up with outdated Hardware. I guess some collectors are happy but I'm just a guy who plays guitar and wants something stylish yet functional.